I had been trying to figure out how to describe this item, since when I tried to search for it the other day I couldn't find quite what I wanted. But my mom encouraged me to persevere (and called me back to tell me there's one at Meijer for $30!). 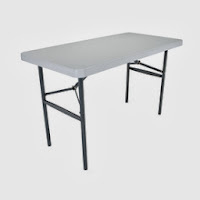 For online purposes, I want a four foot folding table for a little crafting area in my office. 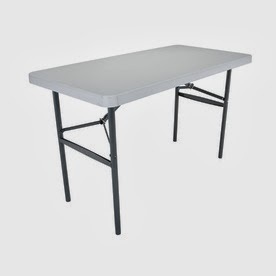 This 48" X 24" available at Lowe's would work quite well. It will go just inside my office door, along the wall leading to a storage cabinet with my business supplies. Now I'm off to search for some document shelving to put underneath at one end, to compensate for my closet shelves that just weren't strong enough for all my paperwork.